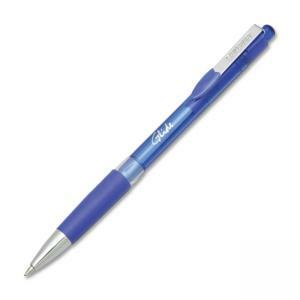 Glide Ballpoint Pen contains revolutionary, low-viscosity hybrid ink that writes as smoothly as a gel pen. This retractable pen delivers ink with the permanence and longer write-out of a ballpoint pen. Tinted, translucent barrel allows visual monitoring of ink levels. Dark, vibrant, quick-drying ink is smear-resistant and water-resistant. Pen also features an ergonomic rubber grip for added writing comfort. Pen is made using minimum 48 percent pre-consumer recycled content by weight. Ink conforms to ASTM D-4236.